Time now for yet another interesting side story in the Major A.G. Happer saga. Through marriage, Major Happer was related to the Baird family of Washington, PA. Theirs is a long & interesting history of which we'll tell an abbreviated version of the parts that occur in the Happer era. From this it's easy to see that the Major A.G. Happer story isn't just about the Major, or his amazing war record, or his incredible service to Washington, PA after the war. It's about service to our fellow man, & about something bigger then ourselves. Stay tuned, there's even more to come! First and foremost in this tale is Absalam Baird. He was born in Washington, Pennsylvania on August 20, 1824. He was the great grandson of a Lieutenant in the French and Indian War, and a grandson of a surgeon in the Continental army during the Revolution. He graduated from Washington College and received an appointment to the United States Military Academy, where he graduated ninth in his class of forty three, in 1849. In 1850-51, he served as a Second Lieutenant during the Seminole War. In 1853 he was promoted to First Lieutenant and served until 1859 as assistant professor of mathematics at the U.S. Military Academy. He spent the next two years serving on the Texas frontier. In March of 1861, he took command of the light battery for the Department of Washington, and on May 11, was brevetted Captain. 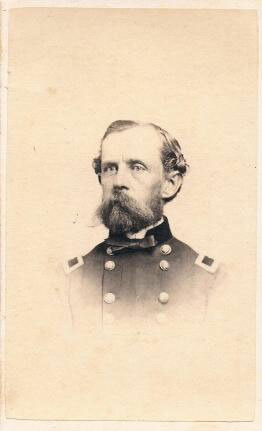 By July of 1861, he was serving as Adjutant General of the Washington defenses. He was present at the battle of First Manassas. In the spring of 1862, he took part in the Peninsula Campaign and saw action at Yorktown and Williamsburg. In April of 1862, he was appointed Brigadier General of Volunteers and was given command of a brigade in the Army of the Ohio, where he was engaged at Cumberland Gap. From October 1862, to June, 1863, he commanded the Third Division in the Army of the Kentucky, and was, for gallant action at Chickamauga, brevetted Lieutenant Colonel of regulars. General Baird participated in the battles around Chattanooga, the fall of Atlanta, and Sherman's march to the sea. He was with Sherman on the march through the Carolinas, and was present at the surrender of Joseph E. Johnston's Confederate army at Durham Station. For his service during the Atlanta campaign, he received a brevet promotion to Brigadier General in the regular army. General Baird eventually received promotion to brevet Major General of Volunteers, and brevet Major General in the regular army. It doesn't end there. The General stayed in the army after the war as Inspector General of various departments, until 1885 when he was appointed Inspector General of the U.S. Army. He retired in 1888. On September 1, 1864, at Jonesboro, Georgia, General Baird had voluntarily led a detached brigade in an assault upon the Confederate works. For this gallant action, he was awarded the Congressional Medal of Honor on April 22, 1896. William Baird was born on August 22, 1851. He was the son of Absalom and Cornelia W. Smith Baird. He followed in his father's footsteps and attended West Point where he graduated 28th in his class of 43 on June 16, 1875. He served virtually his entire career on frontier duty during the Indian wars, finally retiring at the rank of Captain due to a disability in December of 1897. On June 18, 1885 he had married Minnie Dawley in San Francisco, California. They had two children, John A. Baird and Cornelia W. Baird. William died on January 3, 1930 in Washington, D.C. He is buried at the family plot at Arlington National Cemetery with his wife. John A. Baird was the son of Captain William Baird and grandson of General Absalom Baird. Born on June 23, 1890, he followed a little different path. He attended the U.S. Naval Academy at Annapolis. He switched to the U.S. Army, and from 1912 until 1923 he served with the Coast Artillery Corps. From 1923 through World War II and until he retired in 1947 with the rank of Colonel, he served with the Chemical Warfare Service. He was awarded the Legion of Merit for his service. He died on September 30, 1951. He and his wife Helen are buried in the Baird plot at Arlington National Cemetery.